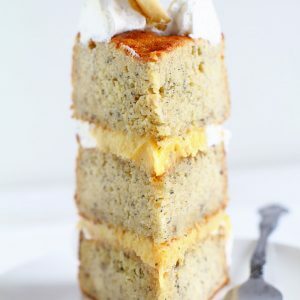 This banana cake with fresh banana curd is one for the archives… lovely and rich and the perfect combination of naturally sweet and satisfying! Heat oven to 350°F. Prepare three 8-inch round cake pans. Put bananas, lemon juice, butter, sugar, and vanilla into stand mixer (or use a hand-held mixer) and mix until incorporated and smooth. With mixer on low, add flour mixture to banana mixture alternativly with buttermilk, beginning and ending with flour mixture. Bake for 28-32 minutes or until center no longer appears wet and an inserted toothpick is removed with few crumbs. Cool in pans on wire rack for 10 minutes, then remove to wire rack to cool completely.